Can you really read your way to better financial decisions? If you’re anything like me, the state of your personal finances gives you heart palpitations on a regular basis. With tax season underway, this constant fear can kick into overdrive. Some people deal with money by pretending their accounts don’t exist or second-guessing their money management skills. I fall into the latter category. I figured I was doomed to live in a world of constant money anxiety until I came across a cheery-looking book on Instagram. Everyone was reading Worry-Free Money: The Guilt Free Approach To Managing Your Money And Your Life by Shannon Lee Simmons. Simmons is not only an author, but also a certified financial planner and life coach who founded The New School of Finance – an affordable financial planning and coaching firm. A few months ago, Simmons visited Kobo HQ to talk about her book, and the excitement in the air was palpable. I confessed my fear of being out of control, and Simmons mentioned she hears this in her line of work no matter how much people make. While the concept of digging into the psychology of spending isn’t in itself revolutionary, Simmons’ book is so approachable that it can kick start conversations about financial health whether you’re starting your first job or getting ready for retirement. The book is not only a guide for determining when your spending is working to your emotional and fiscal advantage (Simmons calls this “happy spending”), but whether you can afford the upgrades you want, such as a new house (my jam!) or a family vacation. Money is a long-standing taboo subject people are still very hush-hush about. But beyond this, perhaps the most helpful part of the book is Simmons’ advocacy on being honest with the people in your life about money. She says money is a long-standing taboo subject people are still very hush-hush about. She points out that we often compare ourselves to others without knowing their financial circumstances. They could be drowning in debt while riding a yacht, or swimming in savings in their studio apartment. This doesn’t mean you need to shout your salary from a rooftop, but it’s a reminder that you never know what’s happening behind the scenes. With my own loved ones, its helped me be honest about my financial goals while continuing to spend on things that bring me joy, such as dining out or a new design book. And while it’s a little early to tell how my long-term finances will be affected, this month was the first in which I didn’t deep-dive into my overdraft. As a result of Simmons’ book, I’m feeling empowered. 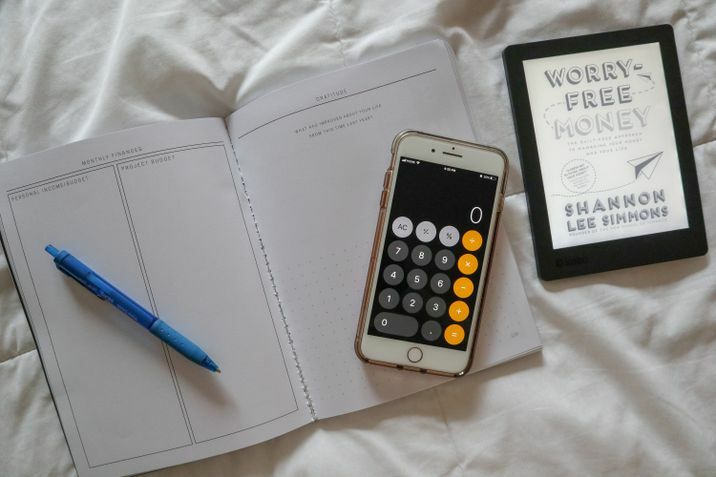 Shannon Lee Simmons' Worry-Free Money is now a Kobo Original audiobook. Narrated by Simmons, listen to the audiobook here.